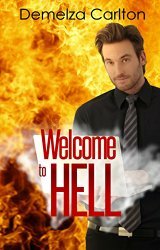 Mel hates job interviews – and this one’s shaping up to be the interview from Hell. From the grumpy receptionist to the disturbingly demonic interview panel and the sleazy CEO, it seems landing her first job is the least of Mel’s worries. Can she make it out of the office alive without selling her soul? This is the short story which begins Demelza Carton’s ‘Mel Goes to Hell’ series, and I have to say, it’s a thoroughly enjoyable and wild ride. Ms Carlton has taken the angels and demons of mythology and transplanted them smack bang into the middle of the corporate world. where Lucifer himself is making takeover bid for the world. It’s up to Melody Angel, a temp worker, to infiltrate HELL (Offices of Health, Environment, Life and Lands Corporation) and investigate what is going on. This story pokes fun at the corporate world with nearly every word. The characters are entertaining, and the premise is certainly unique. A highly recommended read and an enjoyable entree to Ms Carlton’s series. This short story is free, and gives you a taste of Ms. Carton’s unique writing style.